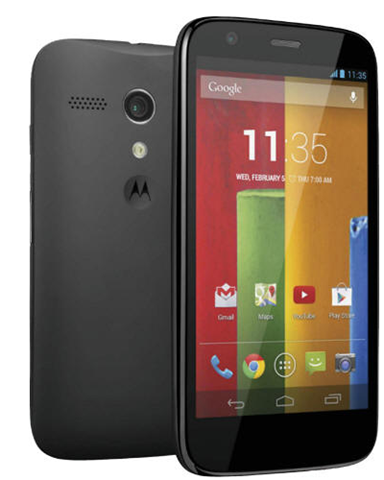 Update: 5/2/2014 The Moto G 8 GB and 16 GB variants have been launched in India for Rs. 12,499 and Rs. 13,999 respectively. Motorola launched Moto G last night which has been priced at $179 and $ 199 for 8 GB and 16 GB versions and has been designed to target markets like India. Apart from Customizable back cover and water proof nano coating, the second phone from Motorola after Google’s acquisition has much more to offer and that too at an attractive price. Let’s take a detailed look at the hardware which promises a premium experience. The Primary camera is of 5 MP and to click images you have to tap on the viewfinder. Don’t worry, as you can enjoy “tap to focus” by switching the feature on from the menu. Other Camera features include 4x digital zoom, slow motion video, burst mode, auto HDR and panorama. The MP count is less considering the price range, but the camera quality is more dependent on the ISO. The Internal storage will come in 8 GB and 16 GB variants and in spite of the removable back cover, you won’t get a microSD card slot. If this phone supports USB OTG, You can connect Flash Drive to your phone and that will definitely solve most of your storage woes. For now the storage can be a limiting factor for quite a few people. The Processor employed is 1.2 GHz Quad core processor which comes on Snapdragon 400 SoC, but will not have krait 300 cores, as are expected in Snapdragon 400 processors. The Cores will be based on Cortex A7 architecture. The Krait cores are much faster and power efficient as is evident from the fact that Moto X the flagship phone, has been getting along smoothly on 2 krait cores clocked at 1.7 GHz. The processor will be backed by Adreno 305 GPU and 1 GB of RAM. Motorola promised this processor to deliver a premium experience. The battery capacity is 2070 mAh which acc to Motorola will comfortably last one whole day and will last 33 percent longer than iPhone 5s on 3G. Considering these claims from Motorola and the guaranteed arrival of power efficient Android 4.4 KitKat, this phone will last longer than other budget phones in this price range. The phone comes with a 4.5 Inch Display with 720P HD resolution, which will give you pixel density of 329 ppi. Motorola claims that this will be the brightest display in its class. The ppi count is sufficiently high to avoid any pixelation. The Display type used is LCD instead of AMOLED display in the flagship Moto X. The display is also protected by extremely resistant Corning Gorilla Glass 3. The phone will feature Android 4.3 Jelly bean operating system out of the box and will support single SIM. The Android 4.4 Kitkat Update will be available in January, 2014. A dual SIM variant of this phone will also be available in India but it will be priced higher. The phone also enjoys Waterproof interior and exterior which makes it more durable. 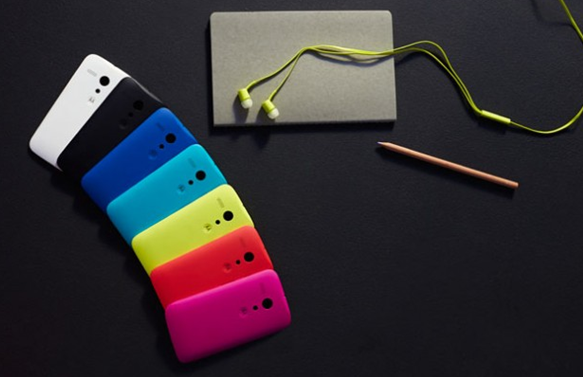 The phone is not fully customizable like its predecessor Moto X but you can choose from different colored back cover and grips. The Dimpled back cover with multi color options truly gives this phone the differentiating look. The body is all plastic and the phone weighs 143 grams. Color options available include black, white, dark and light blue, pink, yellow and red. The connectivity features include 3G, Bluetooth 4.0, Micro USB 2.0, GPS and GLONASS. This phone will give tough competition to all other budget quad core android phones present in the price range of Rs. 15,000 to Rs. 20,000 INR which includes phones like Micromax Canvas 4, Gionee Elife E6, etc. It will also mark a dent in sales of phones like Samsung Galaxy S4 Mini which are selling above the 20 K mark. This phone is one of the best value for money phones but we will wait till the Indian pricing is revealed. Google says that it has reduced cost by importing large number of components right from the start. This is the first international phone from Motorola after Google acquired it. The prospects of resource efficient Android 4.4 Kitkat makes this phone even more appealing. I am looking for a sub10-12k android phone and the requirement is a 5″ screen, 1 GB RAM, Quad core, better battery. If it has a scratch resistant screen and DLNA then it will be an added advantage. I am getting mixed reviews about Micromax HD (flickery screen) and Xolo. Many are saying Xolo has a very poor service. I have read your reviews on Micromax Canvas2Plus, Spice Stellar Pinnacle 535 and Xolo devices. None in the friend circle is sure about the Spice phone which has a non-HD screen but has better specs that any other in the non-HD screen segment. What is your view on the recently launched Xolo Opus and Iball Quadro Andi 5H with respect to longevity, durability and service. Any known issues with these. None! Go for Moto G 16gb..
All these are good only for short use. nothing of the above the best is moto g. also it is of low cost . I am looking to by Moto G 16GB. But I have searched about problem with Moto G and many users are compleaing about connectivity problem, sim detaction problem. So please suggest me is it good time to buy Moto G or go for Others. also please sugges some alternatives.